The sun is out in NH and the weather is finally getting warm! If you notice the photo of my car with snow on it—Mother’s Day surprise—you will share my glee. I have been very busy getting the lake house in shape for summer and consulting on my son’s construction project since my last blog. Lots of fun! Today I want to share with you some delicious vegetarian side dishes that I plan to serve at Hannah and John’s engagement party. It’s a few weeks away, but it’s never too early to get organized! I have chosen 7 dishes to share. I have the recipes available on the TU living Pinterest! All of these will work perfectly with a simple cookout or a more elaborate celebration. An assortment of sauteed mushrooms with caramelized onions, lentils, capers and pine nuts served on a bed of arugula. Drizzled with truffle oil if desired. 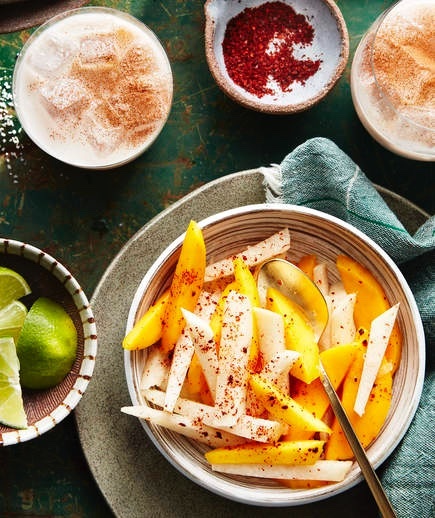 A sweet and savory dish that pairs sweet mango with tart jicama. It’s topped with a lots of lime juice and a bit of red pepper and salt. 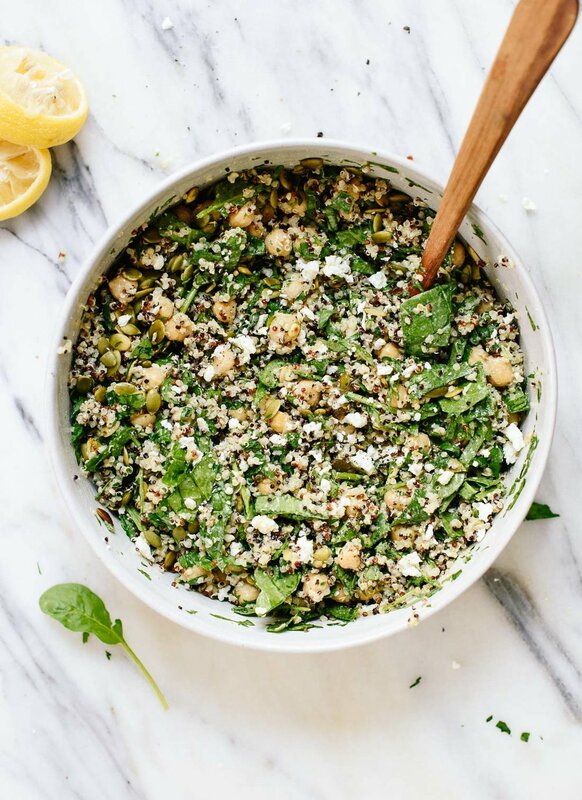 A simple dish made with quinoa, chickpeas, herbs, feta, and pumpkin seeds with a lemony dressing. For a lactose free version, omit the feta cheese. A very colorful dish with ribbons of carrots and disks of beets dressed with a curry dressing. Top with roasted pistachios—be careful of nut allergies. A quick dish that combines kidney beans and chickpeas with an assortment of crisp and tasty vegetables and herbs. Then all of that deliciousness is topped with a lemony dressing. Perfect for lunch the day after the party as it keeps well. All of the flavors you would expect with ‘Greek’ in the title, a mixture of kalamata olives, sundried tomatoes, red onion, feta cheese, spinach and lentils drizzled with a simple greek style homemade dressing. For a lactose free version, omit the feta cheese. Not exactly a side dish, but too delicious to leave out! A mixture of nine simple ingredients including chickpeas, parsley, tarragon, chives and lemon blend together to create this creamy hummus. Serve it with assorted vegetables or pita chips. I had lots of fun searching for tasty alternatives to the traditional sides to serve at the engagement party. I hope you will try at least one of these at an upcoming gathering you are hosting or take one with you to a potluck. Again, you can find all of the recipes for these tasty dishes on TU living's Pinterest. Enjoy the warm spring weather!